I made a beautiful card yesterday with the gorgeous Unity Stamps and I wanted to share it with you. 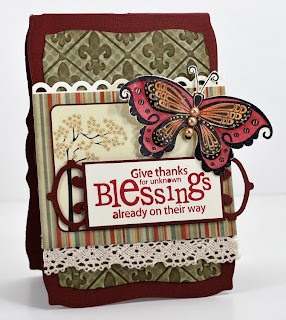 You will also find this card on Angela's Unity blog...whoohoo...I still can't believe I am their Guest Designer this month and just so happy about it. Anyway, this card says it all. One of the things I LOVE about Unity is their quotes, and this quote just so resonates with me! I really am so grateful for everything in life and do practice that, so this card is just very special to me. And wow on that butterfly. I recently purchased the Butterfly Beauty set and it's beyond beautiful. It has the most beautiful 4 butterflies and words that I love and I know I will use a lot. Also, if you are not that familiar with Unity Stamps, as I said above, they have the most beautiful quotes, and while I have a couple of them, I am getting read to order the Quotes bundle package. The stamps are huge and beautiful! So, if you like to give inspirational cards to your friends and family, they are totally a must have set! Well, here is my card I made. Well, hope you like my card and wishing you a fabulous Monday. Tomorrow, I will be back with another one, so please check back.